You might be putting off a task because you've had to re-prioritize your workload. If you're briefly delaying an important task for a genuinely good reason, then you aren't necessarily procrastinating. However, if you start to put things off indefinitely, or switch focus because you want to avoid doing something, then you probably are. *Fill your day with low-priority tasks. *Wait to be in "right mood," or wait for the "right time" to tackle a task. You need to understand the reasons why you are procrastinating before you can begin to tackle it. For instance, are you avoiding a particular task because you find it boring or unpleasant? If so, take steps to get it out of the way quickly, so that you can focus on the aspects of your job that you find more enjoyable. *Poor organization can lead to procrastination. Organized people successfully overcome it because they use prioritized To-Do Lists and create effective schedules . These tools help you to organize your tasks by priority and deadline. Even if you're organized, you can still feel overwhelmed by a task. Perhaps you have doubts about your ability and are worried about failing , so you put it off and seek comfort in doing work that you know that you're capable of completing. Some people fear success as much as failure. They think that success will lead to them being swamped with requests to take on more tasks. Surprisingly, perfectionists are often procrastinators. Often, they'd rather avoid doing a task that they don't feel they have the skills to do, than do it imperfectly. *Another major cause of procrastination is poor decision-making. If you can't decide what to do, you'll likely put off taking action in case you do the wrong thing. For some people, procrastination is more than a bad habit; it's a sign of a serious underlying health issue. For example, ADHD , OCD , anxiety, and depression are associated with procrastination. *Also, research suggests that procrastination can be a cause of serious stress and illness. So, if you suffer from chronic or debilitating procrastination, one of these conditions could be to blame, and you should seek the advice of a trained professional. 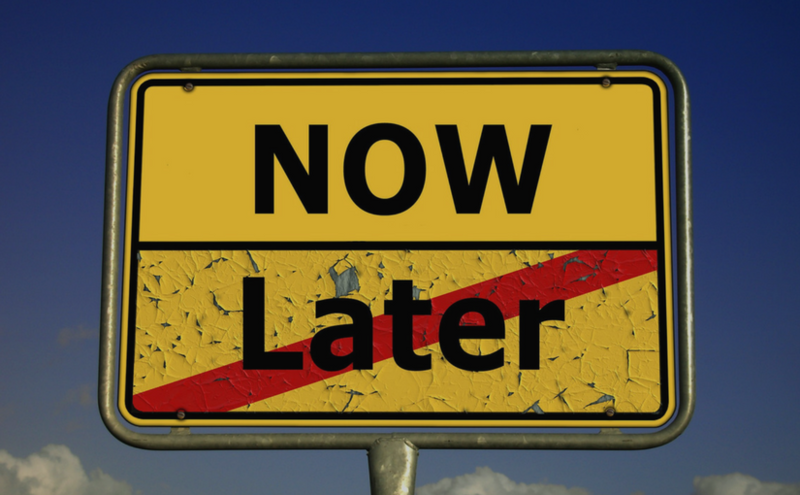 Procrastination is a habit – a deeply ingrained pattern of behavior. This means that you probably can't break it overnight. Habits only stop being habits when you avoid practicing them, so try as many of the strategies, below, as possible to give yourself the best possible chance of succeeding. *Forgive yourself for procrastinating in the past. Studies show that self-forgiveness can help you to feel more positive about yourself and reduce the likelihood of procrastination in the future. Focus on doing, not avoiding. Write down the tasks that you need to complete, and specify a time for doing them. This will help you to proactively tackle your work. If you complete a difficult task on time, reward yourself with a treat, such as a slice of cake or a coffee from your favorite coffee shop. And make sure you notice how good it feels to finish things! *Ask someone to check up on you. Peer pressure works! This is the principle behind self-help groups. If you don't have anyone to ask, an online tool such as Procraster can help you to self-monitor. Tackle tasks as soon as they arise, rather than letting them build up over another day. The phrases "need to" and "have to," for example, imply that you have no choice in what you do. This can make you feel disempowered and might even result in self-sabotage . However, saying, "I choose to," implies that you own a project, and can make you feel more in control of your workload. Turn off your email and social media, and avoid sitting anywhere near a television while you work! *Aim to "eat an elephant beetle" first thing, every day! Get those tasks that you find least pleasant out of the way early. 6 Nigerians to have Won the Grammy Awards!